This project surveys the work of the American born artist James McNeill Whistler (1834-1903), first in oils and mixed media, and then in watercolour, pastel and drawing. This is a 'beta' (first stage) online publication, concentrating on the oil paintings, and will be updated, extended and edited as necessary, with links to relevant blogs and websites. Access is entirely free, and the catalogue is available exclusively online. Since the paintings catalogue raisonné will not be published in book form, we will continue to update it as needed with new data and images. Whistler was a major figure in 19th century art and, as painter, printer, and theorist. He occupied a pivotal role in the history of American and European art and was widely influential to a younger generation of artists. He was an important link between the art worlds of Europe and America and formed significant links with various artistic movements including Realism, the Aesthetic Movement, Impressionism and Symbolism. His paintings show the influence of artists such as Rembrandt, Velázquez, Ingres and Courbet. His total output was substantial: over 550 paintings in oil and mixed media, 490 etchings and drypoints, 1800 works on paper – drawings, pastels and watercolours – and 179 lithographs, lithotints and mezzotints. There are multiple impressions of the lithographs and etching: as many as 10,000 impressions of the etchings are recorded, of which a high proportion were printed by the artist. 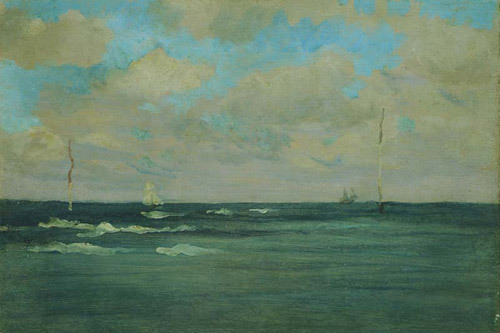 Whistler’s work was exhibited widely and eagerly sought by art dealers and collectors. The study of collecting, from art dealer and exhibiting body to collectors and museums is exceptionally well documented in the case of Whistler; the history of his works bridges the art market on both sides of the Atlantic. He also published letters, pamphlets and books on art, and wrote thousands of letters to a wide range of correspondents, which document and illuminate the history of the creation and marketing of his work. This online catalogue includes some 550 oil paintings and 1800 works on paper, most of which date from between 1850 and 1903. The evolution of each painting from sketch to final oil is described and illustrated, starting with basic information including the title, date, collection, size and medium. This is followed by an extended discussion of the date, subjects, sitters and sites shown in the paintings, a technical survey, provenance and exhibition history, and bibliography. By far the majority of extant works are reproduced in colour: archival photographs (dating from the 1870s through 1890s) are in monochrome. Picture frames are illustrated and described when possible. High resolution digital images of the paintings help to illustrate technique and details. 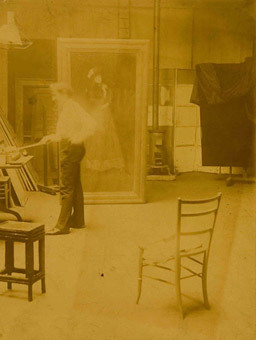 In addition related prints and works on paper by Whistler and visual material by other artists are reproduced. Photographs of sitters and sites, and contemporary photographs from Whistler’s estate and other collections, illustrate the changes and inspiration for his paintings. This project builds on, and links to, the catalogue raisonné of Whistler's etchings and his correspondence. Full documentation is provided: the catalogue is fully indexed, cross referenced, and searchable by word, name, institution, exhibition, and date. The catalogue benefits from much new research on the technique, conservation, and history of individual paintings, including exhibition reviews and contemporary responses to the works, which help to establish the context of works in relation to the art market in Europe and America in the 19th century. 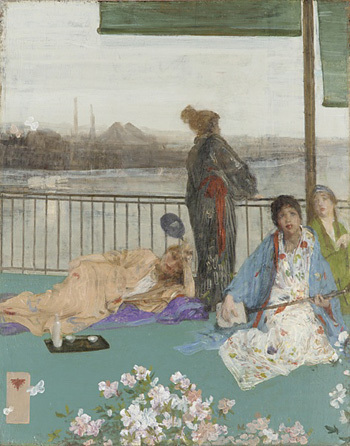 Variations in Flesh Colour and Green: The Balcony, 1865, Freer Gallery of Art, Washington, DC.